Aaron Doran scored his sixth Highland derby goal on Monday. 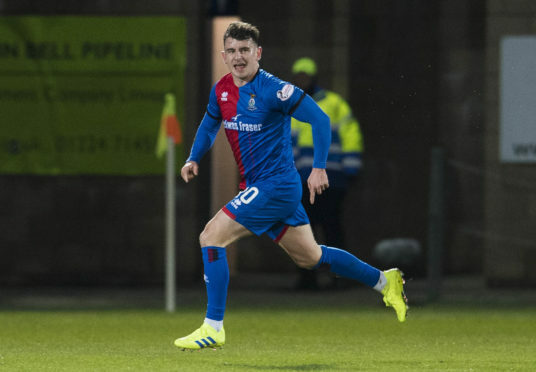 Caley Thistle winger Aaron Doran believes his side have shown they are every bit as good as Ross County and is determined to prove it in Tuesday’s Scottish Cup fifth round replay at Caledonian Stadium. Inverness must face their Highland rivals for a fifth time this season, after the Staggies netted in stoppage time to secure a 2-2 draw in Monday’s last-16 tie at Victoria Park. It was the third draw between the sides this season, with County the only side to have triumphed in a 2-1 victory at Dingwall in December. However, Irishman Doran feels a lack of cutting edge has cost John Robertson’s men the derby results they have merited. Doran said: “What Ross County are doing, we should be doing. That’s why they are 12 points clear of us. “You can see in all the games, they are not a better side than us. But they are taking their chances, and we are not, and we are not seeing the game out. “That’s the only difference, because we are a good team and we create some good chances. “We just need to get better everywhere from the front to the defence in the last few minutes. “This season we are just not seeing out results and that is the disappointing thing. We are a good footballing side, we create a lot of chances and play some nice football. Doran played in the only two Scottish Cup derbies prior to Monday’s match, helping Caley Jags secure a 2-1 replay win following a thrilling 3-3 draw in Dingwall. The 27-year-old hopes home advantage can help his side repeat that feat, with an away tie against Championship rivals Dundee United awaiting the winners next month. Doran added: “I played in that game. They have a few of our players from back then, it was Billy Mckay who scored two in the replay. It’s just really disappointing to concede so late – it feels like a loss. “We get to do it again, and it’s a good game for the neutrals. Everybody will be happy to see it again, but we want to get it over the line. Doran netted a stunning opener on his return to Inverness’ side after being sidelined for the last fortnight, and he added: “It was just a little niggle, I just felt my groin a little bit.